That is the mission statement of Original Strength and the sentence that hooked me on OS. I have been involved with OS since the very beginning. I actually hosted the very FIRST OS workshop, so I have seen or heard the incredible success stories and the positive change this amazing system has created in so many lives. Of all the success stories, there is one that will always be my favorite. The story of Gertrude and Richard is the most special to me for two reasons. First, I am a bit of a softy. I am a HUGE fan of successful relationships between two people. When I hear about someone celebrating their 40th or 50th wedding anniversary, or see a couple that just clicks, it puts a big oI’ smile on my face and my thumb in the air. It is what I hope and work for with my wife. Second, I was humbly allowed to help and make a difference in the lives of these special people. I played an extremely small role in helping change Gertrude and Richard’s worlds through movement and I will never forget the image of this TINY 5’2” barely a hundred pound woman walking into my gym death gripping her husband’s arm. A little over 3 years ago one of our members at Full Force Personal Training asked if I thought I could help his 72 year old mother Gertrude. Gertrude had suffered a heart attack a few years before, and was slowly losing her independence and self-reliance. As each day passed she was a little more and more scared to move. She was terrified of falling. The thought of leaving the house almost took her breath away. Slowly she lost the ability to walk by herself and the only way Gertrude could move her slender frame around was with the assistance of a walker or by holding her husband Richard’s arm. Her whole family was worried that if something didn’t change she would one day lose her ability to walk entirely and they would lose her. Gertrude walked into Full Force PT holding Richard’s arm and looking terrified. Our gym, which is 6000 sq ft and filled with around a 100 KBs and a bunch of barbells, is a little intimidating for people half her age so I can only pretend to understand how frightened she was on her first day. As scared as Gertrude might have been the look on Richard’s face was what I immediately focused on. He had this amazing kaleidoscope of emotions going on. It was a mix of fear that he was slowly losing his best friend. Hope, that maybe this crazy looking gym would be the thing that helped her, and a whole bunch of love. * Side note. He LOVES the living day lights out of this woman is what I thought then and still think every time I see them. The three of us sat down in our office and I explained how I would never make her do anything she didn’t feel comfortable with but that I KNEW in my heart that OS could help her. She looked doubtful but when I told her that we would do everything right in the chair we were sitting on she relaxed a bit and I could see she felt more comfortable. I explained we would start by simply breathing. I told her how I wanted her to breathe in and out through her nose, that I wanted her to have her mouth shut and to place her tongue on the roof of her mouth and that if she did this it would be like telling her brain that it was ok to not be scared. 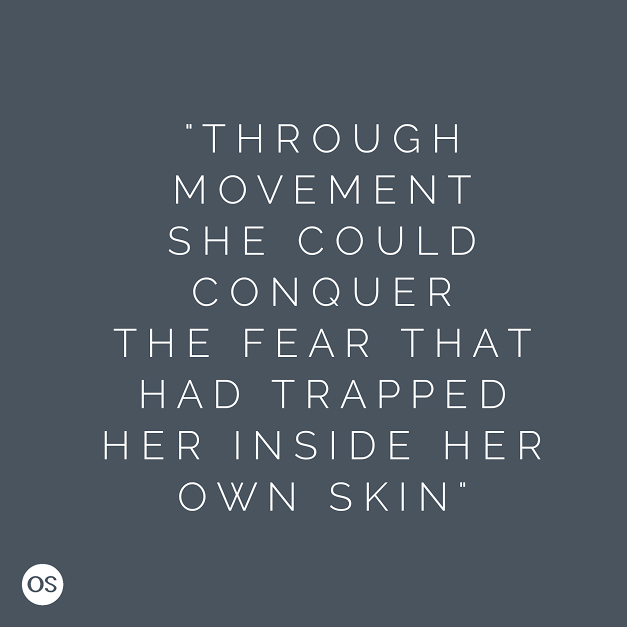 That all the fear she had from her heart attack was still “in” her nerves and that it had changed the way she was breathing and made movement harder. We moved right from breathing into head nods and turns and finished off with just some seated cross crawls. We did this for about five to ten minutes. I told her we were done, and explained that no matter what, no matter how she felt when she came in, there was always a safe place to start moving and we would just take one small step forward at a time until we got where we wanted to go. She smiled a big smile until I told her what I wanted her to do next. I asked her to come with me and to see if she could walk a few steps without help. It took some coaxing but she agreed and we walked out of the office to our turf area we have. She stood next to Richard holding his arm, I asked her to try to breathe the same way she did in the office then let go and take a few steps. She let go of Richard’s arm, I walked closely beside her and she took some steps by herself. I was ecstatic but the really really cool part is what happened next. She walked straight out of the gym! Right out the door, and straight to her car. She looked back waiting with a look I have received many times from my wife. The “what is taking this freakin’ guy so long!? !” look. Richard turned towards me with tear filled eyes, gave me one of the firmest handshakes my hand has felt in a while, and said “Thank you” and walked out AFTER his best friend. I was standing there for a moment in disbelief shaking my head at what just happened. I couldn’t believe it then, and count my blessing now that I got to witness it. All we did that day was follow the principles of OS. We started where Gertrude was. We challenged her but in a safe way. We diaphragmatically breathed. We stimulated her vestibular system. 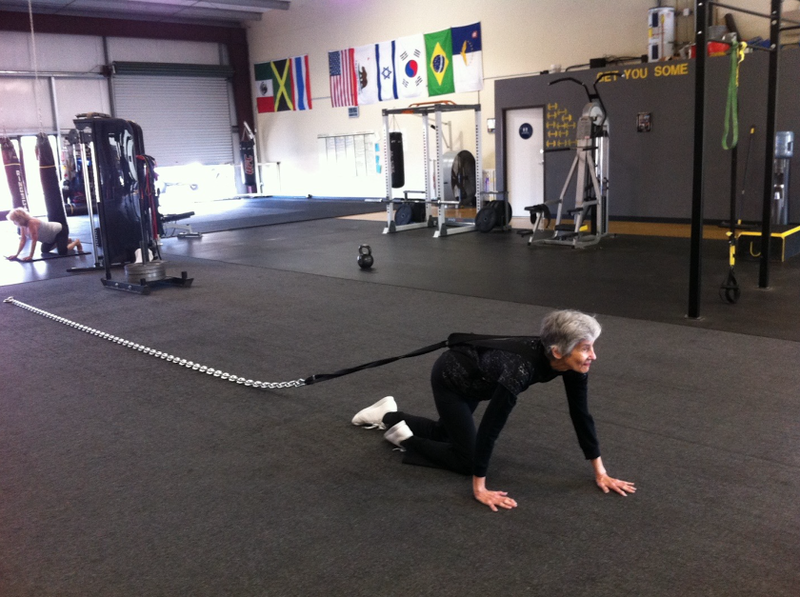 We engaged in cross lateral/mid-line crossing movements like cross crawling, but more importantly we gave Gertrude HOPE. We showed her that she could take her body back. That she was MADE to move. 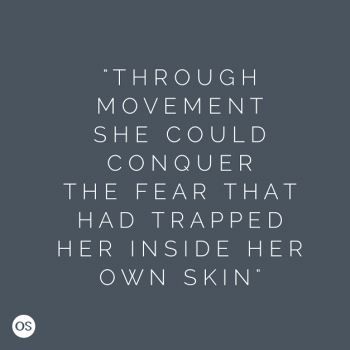 That through movement she could conquer the fear that had trapped her inside her own skin. That day, inside of a gym filled with kettlebells, Original Strength, love, and hope used movement to change the world for two people.